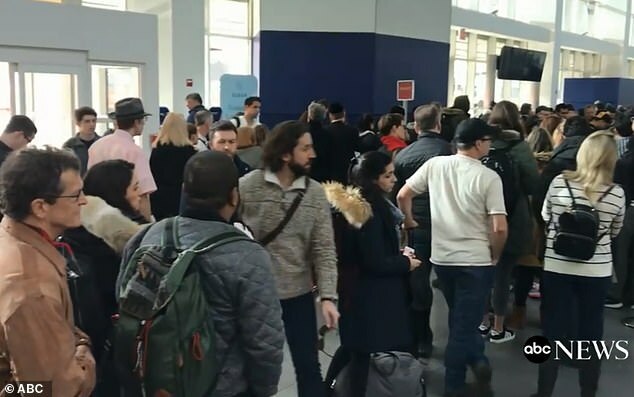 A New York City airport is feeling the effects of President Donald Trump’s government shutdown as hundreds of travelers formed massive lines and several Transportation Security Administration agents called out of work over the weekend. 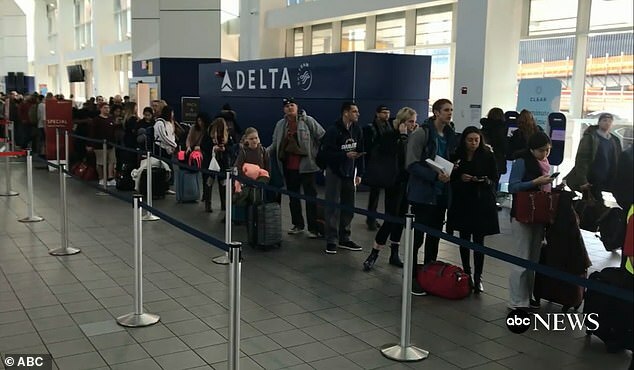 Frustrated passengers were seen waiting in line at the Delta Airlines terminal at LaGuardia Airport on Sunday during the third week of Trump’s partial government shutdown. 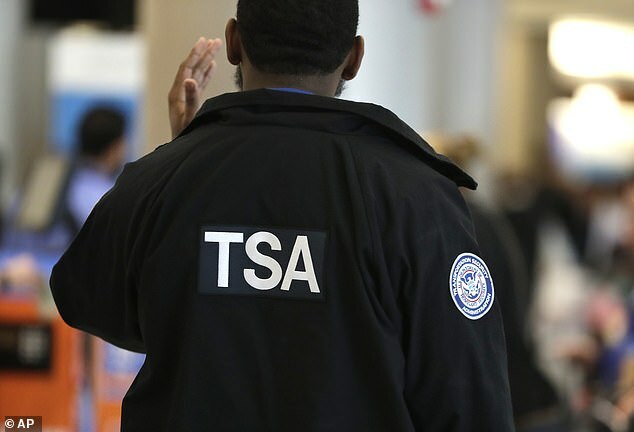 Meanwhile, the TSA reported an increase in callouts by their agents, according to ABC News. 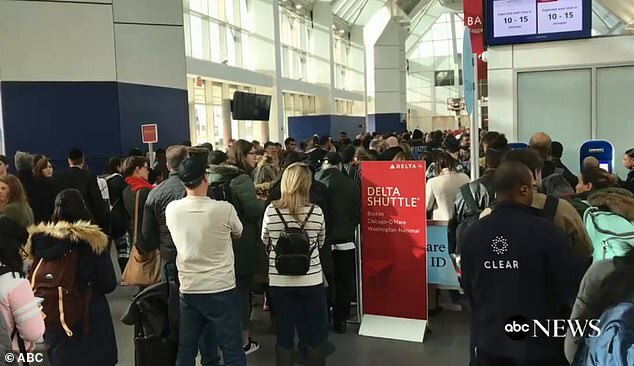 ‘Please, everyone, have patience with the officers who came to work,’ a Delta Airlines employee was heard telling passengers. Sunday’s delays come during the third week of the government shutdown that has left nearly 800,000 federal employees without pay. Also on Sunday, Trump stood by his demands for funding for a border wall as another round of shutdown talks failed to break an impasse. The president, who spent part of the day at Camp David for staff meetings on Sunday, showed no signs of budging on his demand of more than $5billion for a wall along the US-Mexico border. White House officials affirmed that request in a letter to Capitol Hill after a meeting with senior congressional aides led by Vice President Mike Pence at the White House complex yielded little progress. The letter from Office of Management and Budget Acting Director Russell Vought also formalized Trump’s declaration that the wall would be built from steel, rather than concrete, asking for funding for a ‘steel barrier on the Southwest border’. Democrats, though, said the administration failed in both the meeting and the letter to provide a full budget of how it would spend the billions requested on the wall, money the president wants from Congress. The letter includes a request for $800million for ‘urgent humanitarian needs,’ a reflection of the growing anxiety over migrants traveling to the border – which the White House said Democrats raised in the meetings. And it repeats some existing funding requests for detention beds and security officers, which have already been panned by Congress and would likely find resistance among House Democrats. Still, the request makes clear a wall is a top priority. Vought writes that a ‘physical barrier – wall – creates an enduring capability that helps field personnel stop, slow down and/or contain illegal entries’. Trump sought to frame a steel barrier as progress as he returned from the presidential retreat in Maryland, saying Democrats ‘don’t like concrete, so we’ll give them steel’. The president has already suggested his definition of the wall is flexible, but Democrats have made clear they see a wall as immoral and ineffective and prefer other types of border security funded at already agreed upon levels. With the partial shutdown in its third week, House Speaker Nancy Pelosi said she intends to begin passing individual bills to reopen agencies in the coming days, starting with the Treasury Department to ensure people receive their tax refunds. That effort is designed to squeeze Senate Republicans, some of whom are growing increasingly anxious about the extended shutdown. The seemingly intractable budget showdown marks the first clash for Trump and Democrats, who now control the House. It pits Trump’s unpredictable negotiating stylings against a largely united Democratic front, as many Republicans watch nervously from the sidelines and hundreds of thousands of federal workers go without pay. Although Trump tweeted that the Sunday session had been ‘productive,’ two Democrats familiar with the meeting gave a different take, saying the White House had not provided the budget details they had requested and again declined to re-open government. One of the officials – neither was authorized to speak publicly – said no additional meetings were scheduled. Trump said earlier in the day that he was hoping for ‘some very serious talks come Monday, Tuesday, Wednesday’. Among the Republicans expressing concerns was Sen Susan Collins, R-Maine, who said Senate Majority Leader Mitch McConnell should take up bills from the Democratic-led House. ‘Let’s get those reopened while the negotiations continue,’ Collins said on NBC’s Meet the Press. Democrats criticized McConnell for waiting on Trump’s support, but Collins said she was sympathetic to McConnell’s opposition to moving legislation without agreement from the president. Several Republicans pushed the Interior Department to find money to restaff national parks amid growing concerns over upkeep and public safety. And Senate Minority Leader Chuck Schumer, D-NY, suggested Sunday that pressure would only mount amid the shutdown, which he said is disrupting Transportation Security Administration operations, home loans and farmers in his state. ‘Democrats and now a growing number of Republicans are coming together and saying let’s open up the government and debate border security separately,’ Schumer told reporters in New York. Adding to concerns, federal workers might miss this week’s paychecks. Acting chief of staff Mick Mulvaney said on NBC’s Meet the Press that if the shutdown continues into Tuesday, ‘then payroll will not go out as originally planned on Friday night’. 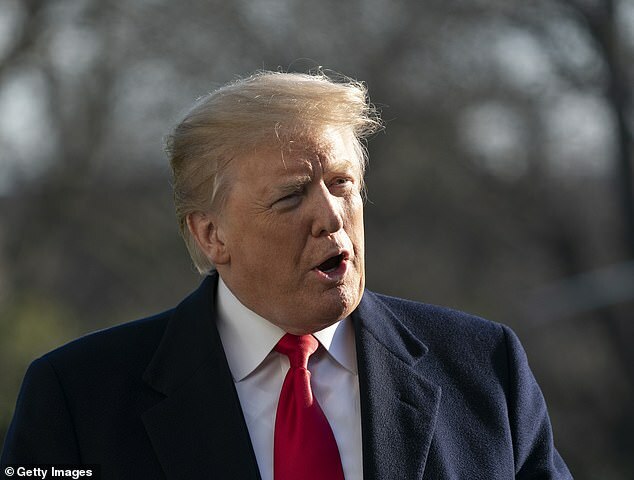 Trump reaffirmed that he would consider declaring a national emergency to circumvent Congress and spend money as he saw fit. The president also asserted that he could relate to the plight of the hundreds of thousands of federal workers who aren’t getting paid, though he acknowledged they will have to ‘make adjustments’ to deal with the shutdown shortfall. Trump also tweeted that he didn’t care that ‘most of the workers not getting paid are Democrats’. The president said he planned to call the heads of American steel companies in hopes of coming up with a new design for the barrier he contends must be built along the southern border. His administration has already spent millions constructing wall prototypes near the border in San Diego.